As a mom, it can be quite a challenge for me to do something only for myself. I sneak in 'me time' whenever I can, but it is a rare treat to actually be pampered! 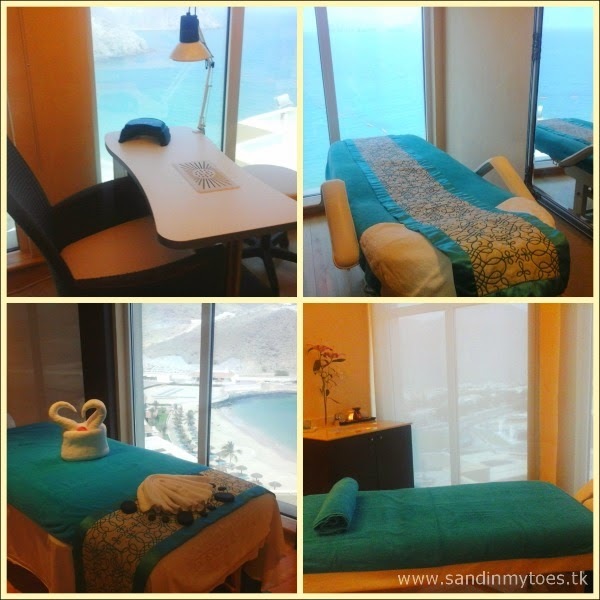 When we visited the Oceanic Khorfakkan Resort and Spa, I was given an opportunity to try a treatment at their 360 Health Club and Spa. It had been a while since I had stepped into a spa, so I was looking forward to it. The 360 Spa is an inviting place with friendly staff, and sauna facility available for all guests of the hotel. There are separate sauna and treatment areas for men and women. Given the stunning location of the resort, it was no surprise that 360 Spa has some of the most beautiful views of the mountains against the sea that you can expect at a spa. I opted for their signature Oceanic Spa Body Massage, and was introduced to Marlyn, who would be doing the treatment. The fragrant and dimly lit room was perfect for unwinding and letting any stress out of my system! Prior to the treatment, I had filled in a form stating any medical conditions and whether I wanted the spa professional to focus on anything in particular. This is an important step of any spa treatment, which is why it is important to get there at least 15 minutes early. I had asked Marlyn to focus on my feet which get stressed easily and she started with them for my massage, using warm oil. With her firm and practiced hands, she used the right amount of pressure, moving from my feet to back, and arms. The pressure was perfect to relax my muscles, and reinvigorate them. The treatment lasted for an hour, and ended with a very relaxing head and shoulder massage. 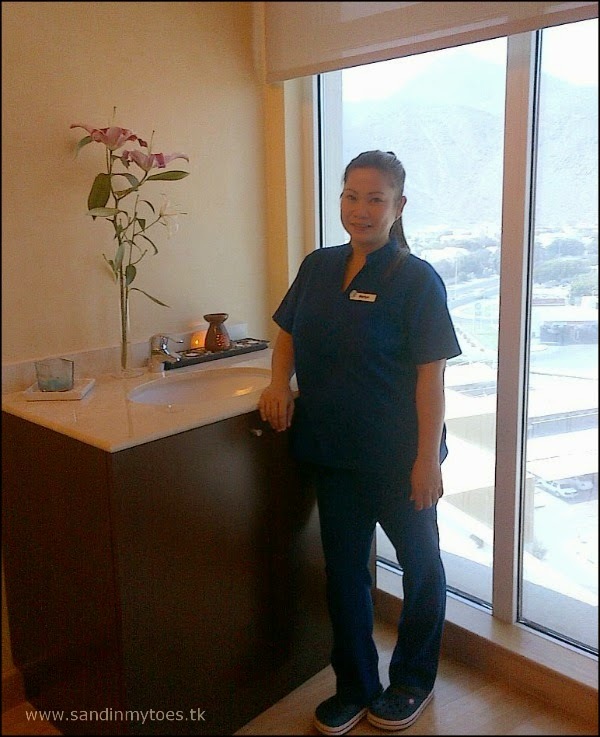 When I asked Marlyn about the techniques used in the Oceanic Spa Body Massage, she said it was a combination of aromatherapy, reflexology, Shaitsu, and Swedish massage. Well, whatever it was, it made me feel great! A hot shower and herbal tea made my 'pampering hour' perfect, and I am glad I went for it. Check out all the treatments available at 360 Health Club and Spa on their website. They also have a special Autumn Offer of 50% off on select Oceanic treatments, and have also introduced a new Chi Balancing Body Massage at a special price. Contact them on +971 9 208 4192 for bookings and more details. If you are in the UAE on a visit or a resident looking for a quick getaway, I would recommend Oceanic Khorfakkan Resort and Spa for a family holiday. Read about our stay at the resort here. I was invited to visit the 360 Health Club and Spa at Oceanic Hotel, but all views and opinions are my own. It's an amazing view, right? !